During those years she must have delivered many, many babies - were you one? I was, in 1948, and so was my brother in 1957. In the picture the lady just behind her is Sheila Cooper. The tall man behind Nurse Millard is Dr Saunders and I think I can see Drs Nicholls & Timms at the back on the left. She was awarded the MBE or OBE after she retired. Are you in the photo? 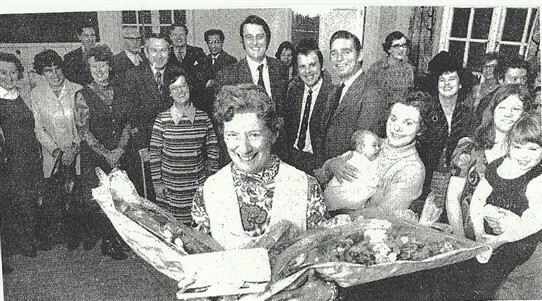 Do let us know if you recognise anyone or have any stories about Nurse Millard or the doctors in the picture. This page was added by Viv Irvine on 10/04/2011. Not sure if either of these fit the description by Don but in 1956 (April) the relief nurses were N.Foster 128 London Road Rayleigh and N.Baines of Hockley. Nurse Millard delivered me at this time at home in Trinity Road Rayleigh. Nurse Millard delivered me on September 10th 1956, my mother and father are still alive and they could tell you about the event better than myself. I believe nurse Millard and my father had a quick tipple after I was born! My wife and I moved from South London to Rayleigh in 1956. A year later our first son was born; delivered by the lovely Millie. A natural birth at home. I recall at the moment of delivery Millie ‘shooshed’ me out of the room saying, “get out you’ve done your bit”. Two years later our second son arrived and we were disappointed that Millie was unable to attend. My wife was frightened when the mid-wife stood in the bedroom doorway. An extremely large lady, of Germanic appearance, with a foreign booming voice, and a pretty reasonable ‘moustache’. But she turned out to be very sweet and gentle. Can anybody identify her please?